What a wonderful day the last Wednesday of the last full week of April is! It is Administrative Professionals' Day! A day specifically set aside to appreciate the amazing secretaries, receptionists and all other people in the administrative field for all of their hard and tireless work! *we certainly don't agree with the cigarette, but come on: you just know she's wearing a fabulous corset under there! 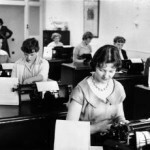 In 1955, the observance date of Administrative Professionals' Day (originally called 'National Secretaries Week') was moved to the last full week of April. The name was changed to Professional Secretaries Week in 1981, and became Administrative Professionals Week in 2000 to encompass the expanding responsibilities and wide-ranging job titles of administrative support staff. So to all you amazing administrative assistants out there: keep up the fantastic work! Nothing would get done without you!